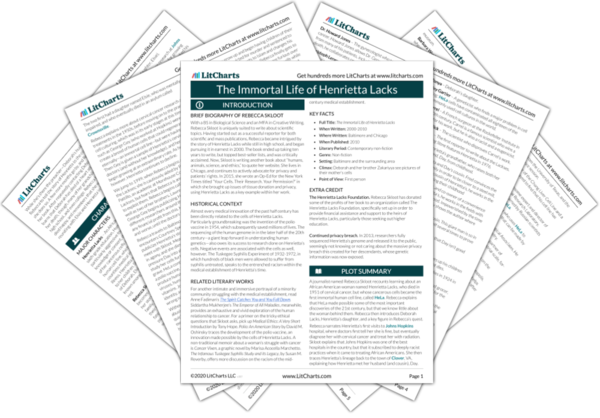 Instant downloads of all 942 LitChart PDFs (including The Immortal Life of Henrietta Lacks). 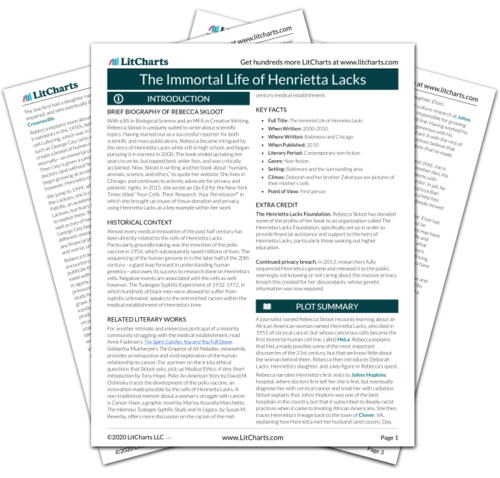 LitCharts assigns a color and icon to each theme in The Immortal Life of Henrietta Lacks, which you can use to track the themes throughout the work. As HeLa spreads, a well-respected virologist named Chester Southam becomes worried that the cancer cells may infect scientists. He and many colleagues believe that cancer may be caused by a virus or immune system deficiency, and he decides to test these theories using HeLa, injecting cancer patients with doses of HeLa to see whether Henrietta’scancer will spread. He tells the patients that he is testing their immune systems. Tumors begin to grow on their arms within hours. Southam removes some of these, while others vanish on their own. Four patients, however, experience a recurrence. We now enter a new phase of the novel: in which Skloot begins to discuss other ethical lapses by researchers who chose to mislead or lie to their human subjects. It is appropriate, given the mistreatment at her physicians’ hands that Henrietta experienced, that Southam should use HeLa cells in order to inject his patients with cancer—an idea that is nothing short of shocking in the present day. Southam decides to see how healthy people will react to the injections, and to use prisoners as subjects. Fifteen years later, research on inmates would become heavily regulated because of the difficulty of obtaining informed consent, but at this time, inmates were being used all over the country for experiments, some of them dangerous. In June 1956, helped by his colleague Alice Moore, Southam begins injecting prisoners with HeLa. The tumors grow in the prisoners’ arms, and the press begins writing stories about their bravery in agreeing to participate. Skloot now brings up the idea of informed consent, meaning that humans must understand and agree to procedures before they can be carried out. Prisoners, however, present a tricky ethical barrier because they are relatively powerless, and can be easily bribed or forced into agreeing to experiments that they do not fully understand. Southam, however, appears not even to have considered such ethical concerns. Southam eventually injects HeLa and other cancer cells into more than 600 patients. When he does so, he says simply that he’s testing for cancer. He believes that this is true, because people with cancer seem to reject the cells slower than people without the disease. Rebecca asserts that he was deliberately withholding information, however, in order to keep people from refusing to participate in the study. In actively lying to his patients about the purpose and facts of his study, Southam crosses even further into unethical behavior. He has made a value judgment that his research matters more than his individual patients’ consent or their health, a choice that Skloot rigorously condemns. In July 1963 Southam makes an agreement with Emmanuel Mandel, the director of medicine at the Jewish Chronic Disease Hospital in Brooklyn, deciding to inject 22 patients with cancer cells. When Mandel instructs his staff not to tell patients that the injections contain cancer, three of the doctors refuse, comparing the injections to research done by Nazis. This moment represents a turning point in the Southam story—for the first time, physicians begin to question the morality of his research. It’s also telling that only fellow physicians were able to speak out against Southam, not patients. 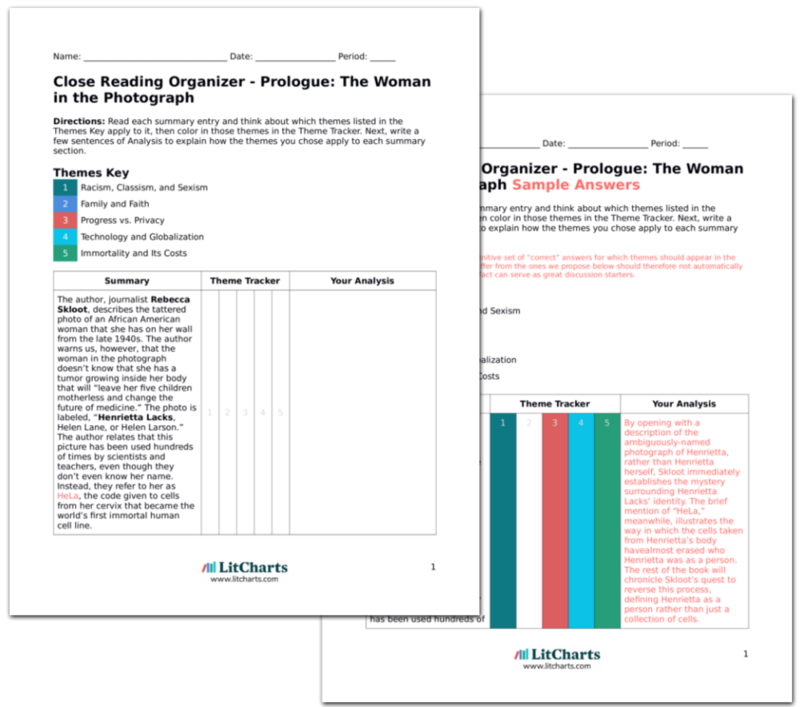 Get the entire Henrietta Lacks LitChart as a printable PDF. Rebecca gives background on the Nuremberg trials, in which seven Nazi doctors were sentenced to death by hanging for the “unthinkable research” they conducted on Jewish prisoners. The tribunal creates a code of ethics called the Nuremberg Code, which governs “all human experimentation worldwide.” Most importantly, it emphasizes the necessity of “voluntary consent.” The Code, however, is not law, nor is it taught in medical schools at this time. Skloot briefly touches on the most extreme and evil example of doctors mistreating their research subjects: the “experiments” that Nazi scientists conducted on Jewish and other minority victims during the Holocaust. The horrific truths that emerged after WWII at least began a discussion of research, ethics, and consent, but governing bodies did not make any attempt to actually regulate such issues. Rebecca traces the origins of the phrase “informed consent,” first used in 1957 in a civil court ruling for a patient named Martin Salgo, who was paralyzed from the waist down during a routine procedure. His doctor hadn’t informed him that the procedure carried any risks, and a judge ruled that this was in violation of a doctor’s duty and a patient’s rights. “Informed consent” is a crucial concept in the book, and Skloot brings it up repeatedly. It’s important to note that the idea didn’t even have a name until years after Henrietta’s death. This book is not just about medical innovation, but also about the evolution of ethical/medical thought. The three doctors who refuse to help Southam believe that injecting cancer cells into a person without their consent is in “clear violation of basic human rights and the Nuremberg Code.” Mandel bypasses the doctors and has a resident give the injections, and the doctors resign and send their resignation to a reporter. Mandel accuses the doctors of being too sensitive because of their Jewish heritage, but a member of the hospital’s board of directors, a lawyer named William Hyman, is appalled. He asks to see the records of the study’s patients, but his request is denied. Terrible events like the Nazi experiments canat least show people (like the three doctors in question) the absolute extremes of immoral behavior. It is important to remember, though, that all those who object to Southam’s experiment are powerful, educated, white men. They have a voice in this system; poor, black women like Henrietta do not. Simultaneously, Sweden penalizes a cancer researcher named Bertil Björklund who has given himself and his patients injections of HeLa cells. In punishment, he has been expelled from his laboratory. Hyman hopes that Southam may be similarly punished. He sues the hospital for the study’s medical records, comparing Southam to a Nazi scientist. As publicity around Hyman’s suit grows, the powerful legal establishment butts up against the powerful medical establishment. Shockingly, many doctors see no problem with Southam’s research, despite powerful legal arguments that disagree with them. Although the hospital calls the suit “misleading,” the media latches onto the story. New York State Attorney General Louis Lefkowitz begins investigating the study, accusing Southam and Mandel of “fraud and unprofessional conduct.” He asserts that human beings have a right to decide what is happening to their bodies. Many doctors testify that they’ve conducted similar research, and argue that it’s not necessary to obtain consent. The New York Medical Board of Regents finds Southam and Mandel guilty, suspending their licenses for a year. The suspension is eventually converted to probation. At this point in time, many scientistsbelieved thatthe only way to continue medical innovation (and thus save exponentially more lives) was to violate their patients’ rights. Given this mindset, it becomes much easier to understand how a genuinely good person like Gey believed it morally right to sample and replicate Henrietta’s cells without her consent. Southam’scase gets the attention of the NIH, which investigates the organizations it funds and finds that under 20% of them protect research subjects’ rights. As a result, the NIH decides that any proposal that it funds must be approved by an independent review board to make sure that they follow the NIH’s code of ethics, which includes informed consent. This is an important sea change in the argument of privacy vs. progress—or essentially, how important the concept of informed consent is, even when it might stand in the way of potential medical breakthroughs. Scientists complain that informed consent will doom their research. Later that year, however, a Harvard doctor named Henry Beecher publishes a study showing that hundreds of studies have breached ethics with methods similar to Southam’s. The scientists who lament the idea of informed consent are basically saying that in their research, the ends justify the means. This belief is finally being seriously questioned. Hoyt-Disick, Gabrielle. "The Immortal Life of Henrietta Lacks Chapter 17: Illegal, Immoral, and Deplorable." LitCharts. LitCharts LLC, 29 Jun 2016. Web. 22 Apr 2019. Hoyt-Disick, Gabrielle. "The Immortal Life of Henrietta Lacks Chapter 17: Illegal, Immoral, and Deplorable." LitCharts LLC, June 29, 2016. Retrieved April 22, 2019. https://www.litcharts.com/lit/the-immortal-life-of-henrietta-lacks/chapter-17-illegal-immoral-and-deplorable.